I can still recall the excitement I felt at seeing my first kangaroo in Australia. It was at a wildlife park in Perth. Even today, after seeing heaps and heaps of kangaroos, I am still in awe of these magnificent creatures. 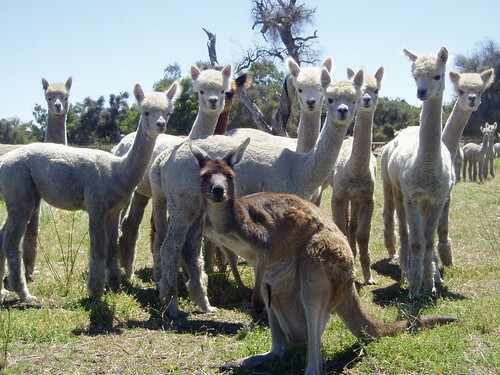 However, one of the most beautiful moments I experienced first hand was at an alpaca stud. The picture I captured below speaks for itself. If you live in Australia and have not witnessed a kangaroo in action, whether jumping over a fence or hopping across a paddock, then you would not be able to comprehend how fascinating these creatures are. The amount of spring in their heavily muscled tail and the agility of these marsupials is quite breathtaking. The average vet in Australia would have examined a kangaroo in practice. We mostly get joeys brought in after they have been discovered in their dead mom’s pouch. I have also examined pet adult kangaroos with traumatic injuries. By far, my funniest tale with a kangaroo was this adult male that was picked up by this random person just because it was sitting quietly near the road. It was so tame that it let him load it up in his truck. My examination showed it was perfectly healthy and actually desexed. I placed my first call to our local wildlife carer. She smiled and said: you have got ‘Jimmy, he was picked up right in front of his home and his owners are worried sick about him. Seriously who would have thought! Unfortunately we generally get a hold of a joey because of tragic circumstances. It is not uncommon for a driver here to inadvertently run over a kangaroo especially at dawn. Kangaroos get bedazzled by the car lights and noise and can jump in front of your car in a flash. If you hit a kangaroo, the right thing to do is to stop and check to make sure it is dead. Otherwise you must notify the ranger so they can put it down humanely. 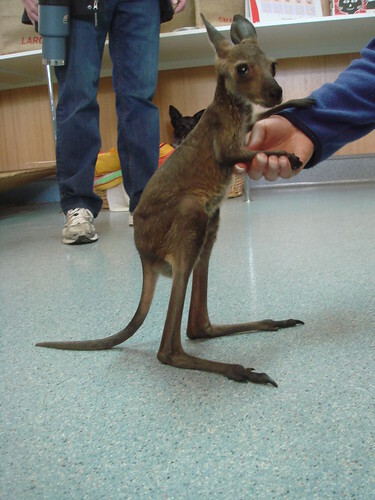 If the kangaroo is a female, it is pivotal to check its pouch as that is when a joey may be discovered. Our job is to examine the joey and ensure it does not have any significant injuries. We then hand it over to a licensed and qualified wildlife carer. 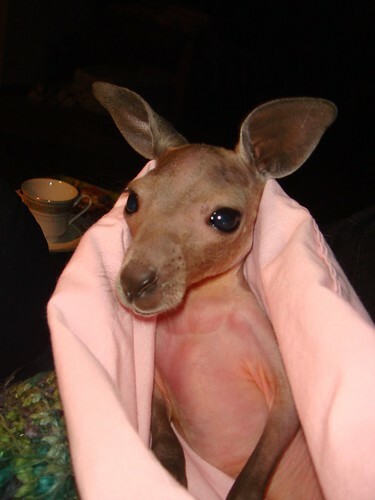 In the country, lots of people have had a go at rearing a joey instead of getting a vet or wild life carer involved. For those that do bring them to us, we often find that the finders of the joeys want to be their keepers. I can totally understand how easily they bond to these beautiful animals and why they feel the urge to nurture them. However, after I have thoroughly discussed the joey’s basic requirements with them, they often back down. It is a fairly involved process and requires the utmost dedication and care. Wildlife carers are like Mother Teresas to Australian native animals and they usually dedicate their whole lives to just rehabilitating injured wildlife. I am very fortunate to have established a very close relationship with Kate Roach. She is a terrific and very dedicated wild life carer in Naracoorte in South Australia. She never failed to astound me with her willingness to give everything a good go, even the pinkies (furless marsupials) that were considered a lost cause. She rarely lost any animals that were under her care. 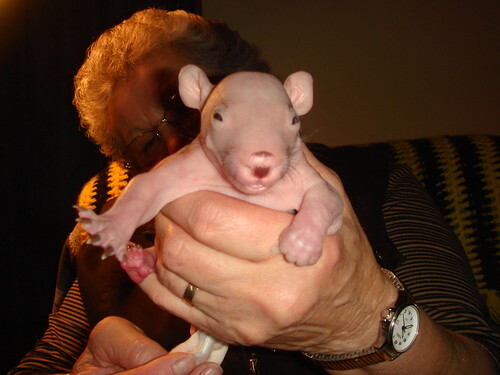 Below is a picture of a pinky wombat that she successfully reared and a joey underneath it. 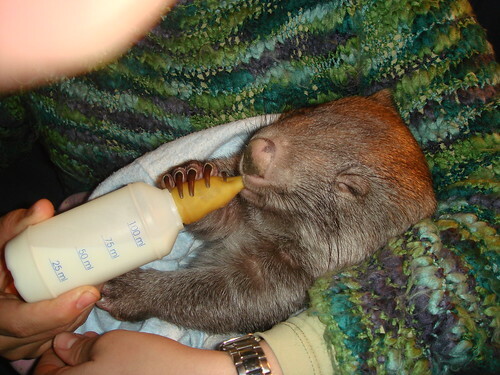 I would like this blog post to be a tribute to wildlife carers around Australia who are doing great work. I highly respect and value their dedication and contribution to the preservation of native creatures unique to Australia. 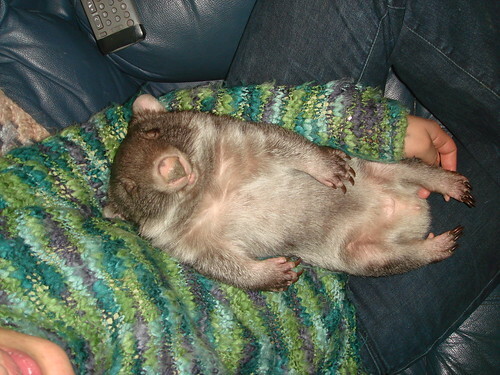 I leave you with my fave pic of one of Kate’s wombat after I had fed him. They are magnificent creatures :-). Glad you appreciate them too. KANGAROOS are the nicest animals , its terrible the way people treat the poor old KANGAROO , i wish people would treat them better . I agree those magnificent native creatures should be treated much better then they currently are. TRACEY It’s me , hello there in QLD . Reading this post for the second time what a dream come true to be a vet and live in Australia. Thank you for sharing with all of us.